There are many places where you can imagine a retrospective taking place of the work of Yves Saint Laurent. Paris, of course, where it all began. New York, where the ladies of the Upper East Side have traditionally preferred him. London. Moscow. Geneva. But one place you do not expect to find a YSL retrospective is 20 minutes by taxi from Darlington station. That really is a surprise. Mind you, the Bowes Museum, in Barnard Castle, is full of surprises. The actual building is such a surprise, it might more properly be termed a shock. You know how Ayers Rock pokes up suddenly from the Australian Outback? That’s the way the Bowes Museum pokes up suddenly from the sleepy market town of Barnard Castle. What in Louis XVI’s name is this gigantic chateau doing in Co Durham? It turns out that it was put there at the end of the 19th century by John Bowes and his French wife, Joséphine. He was the illegitimate son of an earl with pots of money. She was an actress with a taste for gewgaws, especially French ones. Put the two together and you have a societal pairing determined to challenge every local convention by building an enormous faux chateau on the banks of the Tees and filling it with ceramics, clocks, textiles, tapestries and costumes. The resulting super-folly turns out to be the perfect venue for a celebration of Yves Saint Laurent. As a designer, Saint Laurent is credited with some serious social impact. The pioneering trouser suits he championed for women, tuxedos for girls and all that, struck a whack for equality between the sexes. Before Saint Laurent, it was men who wore the trousers. After Saint Laurent, it was whoever had the longest legs. He was a pioneer, too, in boosting the ambition and respectability of off-the-peg clothing. Those who couldn’t afford his couture might nevertheless afford some YSL. Yet social impact doesn’t quicken the pulse. And to its credit, this Bowes Museum retrospective only mentions Saint Laurent’s societal goodness in passing as it sets about the real business at hand: proving how thrilling his work could be and making clear that he was a genius in his field. Yes, I did use the word “genius” there. I’m not one to scatter it about in any context, especially not in the context of fashion. But in this instance, it applies. The show gets into its stride immediately, with an opening vestibule created from swathes of dark chiffon that direct you through the holdings of the Bowes Museum while allowing you seductive peeps of the pleasures beyond. Written on these fluttering swathes of see-through chiffon are some of Saint Laurent’s most emollient sayings. I particularly enjoyed: “The most beautiful clothes that can dress a woman are the arms of the man she loves. But for those who haven’t had the fortune of finding this happiness, I am there.” So open that chequebook, madame. These beautiful lies are followed by a set of cases filled with examples of historic clothing from the permanent collection of the Bowes Museum, infiltrated by some seminal and matching creations of Saint Laurent’s. Thus, a case filled with “practical” women’s clothing — army uniforms, a spartan wartime wedding dress — is the setting for his first trouser suit, a pinstriped number from 1967. Where the other clothes in the case exude an air of quotidian practicality, Saint Laurent’s trouser suit seems instead to pick a fight with respectability as it marries Al Capone pinstripes with lesbian chic. The Bowes is celebrated for its textile holdings. Perhaps that is why this unlikely event has ended up here. Another of the historic cases is devoted to chantilly lace, a material of which the Bowes Museum has the finest collection in the world. That gorgeous embroidered bodice with the chantilly lace collar was made for Empress Eugénie, wife of Napoleon III. 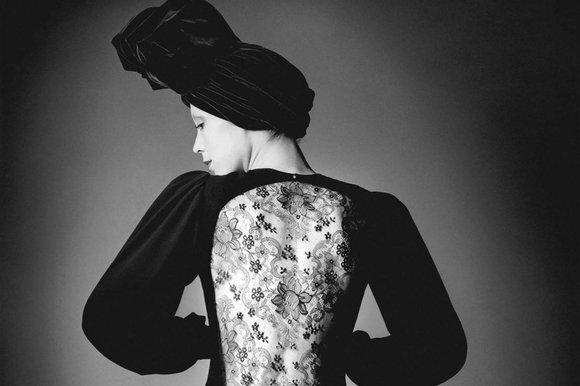 But the black dress in the same case, the one with a transparent inlay of black chantilly lace on the back, that’s by Saint Laurent, from 1970. From the front, it’s as buttoned-up and prim as a Shaker schoolteacher. From the back, it’s near as damn naked. This is haute couture that has learnt the secrets of tailoring from Sigmund Freud. Having introduced us to Saint Laurent’s driving impulses, the show unfolds cleverly across the lofty spaces of the Bowes, with an assortment of pocket displays focusing on different aspects of his creativity. An especially helpful section highlights the care he lavished on the initial shaping of his outfits. His trial garments, or toiles, shaped plainly from white calico, might almost be works of modernist sculpture, so precisely do they cleave the air. It’s an impression continued in a fabulous display devoted to his hats, where the attention that Saint Laurent pays to the underlying forms — the spheres, the cones, the cubes — ends up with shapes as plangent as a Jungian archetype. There are many reasons why this exhibition is as good as it is, but the most obvious is that it has been brilliantly curated to unfold in exactly the right directions. Everything works. Having made something unexpectedly exciting out of Saint Laurent’s sculptural exactitude, the display moves on to his textures, most of which are set in that section of the bandwidth that I would label intoxicating. A decorative evening jacket from 1991, featuring flowers, tendrils and catkins, embroidered with beads, silk thread, raffia and rhinestones on striking white organza, has a mood that is simultaneously Islamic and papal. As for the short evening ensemble from 1988 that pays homage to Van Gogh by covering itself entirely with irises made of sequins and silk ribbons — they must have seen me coming. The show’s final and most spectacular room is devoted to the various looks that Saint Laurent favoured. Each of his signature styles — the blurring of masculine and feminine; the art look; the transparent look — is represented by the best examples that survive. It’s a stunning selection. If you pay attention to the dates of every garment, you can follow the path of his development. But I recommend ignoring this sensible approach and treating every sight as a sartorial sculpture. Time and again, it’s the line made in space by Saint Laurent’s precise forms that really impresses. Even something as obvious as his Mondrian dress — Mondrian rectangles on a sleeveless mini — seems somehow to have arrived at the perfect outline. All this is achieved with care, attention to detail, drama and, of course, extravagance. But never with gimmicks. Nothing here looks unwearable or unfeasible. Unlike Alexander McQueen, who wowed them at the V&A this year, Saint Laurent never steals looks from other forums and clamps them onto his own work. Instead, the sense of purpose that is his trademark seems always to grow from within the outfit. It’s brilliant stuff. And it has resulted in the best fashion exhibition I have ever seen.